Prices do not include gratuities for guides/tour managers. Land only price does include flights Miami-Cienfuegos & Havana-Miami, as well as the arrival transfer. It is recommended that passengers select flights that arrive in Miami no later than 5 pm on Day 1. It is recommended that passengers select flights that depart Miami no earlier than 4 pm on Day 9. The Ultimate Learning Tour: Consistent with the requirements of the OFAC People-to-People license, this program features a full-time schedule of cultural exchange between Discovery Tours participants and your Cuban hosts. There will be little or no free time on most days, except perhaps during a free evening when you're welcome to seek a local restaurant for dinner. Zika Virus - Passengers are recommended to visit www.cdc.gov/zika/ for current information. CDC advises pregnant women to avoid travel to the countries visited in this itinerary. 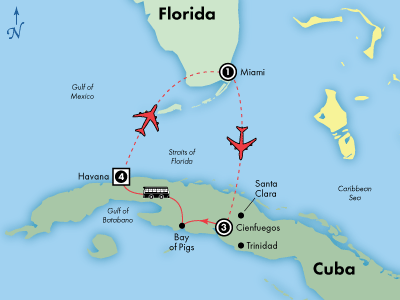 Any passengers born in Cuba, regardless of current citizenship, must notify Discovery Tours by Gate 1 at the time of booking as additional entry restrictions or fees may apply.